1971 In the Shadow of Man. Boston: Houghton Mifflin; London: Collins. Published in 48 languages. 1986 The Chimpanzees of Gombe: Patterns of Behavior. Boston: Bellknap Press of the Harvard University Press. Published also in Japanese and Russian. R.R. Hawkins Award for the Outstanding Technical, Scientific or Medical book of 1986, to Bellknap Press of Harvard University Press, Boston. The Wildlife Society (USA) Award for "Outstanding Publication in Wildlife Ecology and Management." 1990 Through a Window: My Thirty Years with the Chimpanzees of Gombe. London: Weidenfeld & Nicolson; Boston: Houghton Mifflin. Translated into more than 15 languages. 1991 Penguin edition, UK. 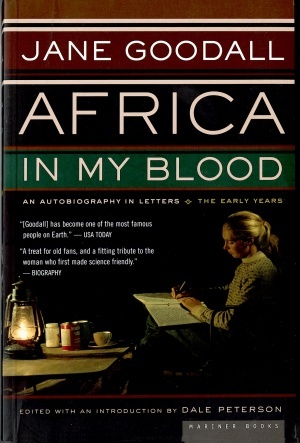 American Library Association "Best" list among Nine Notable Books (Nonfiction) for 1991. 1993 Visions of Caliban (co-authored with Dale Peterson, Ph.D.). Boston: Houghton Mifflin. New York Times "Notable Book" for 1993. Library Journal "Best Sci-Tech Book" for 1993. 1999 Reason For Hope: A Spiritual Journey (with Phillip Berman). New York: Warner Books, Inc. Translated into more than 13 languages. 1999 40 Years At Gombe. New York: Stewart, Tabori, and Chang. 2001 Beyond Innocence: An Autobiography in Letters, The Later Years (edited by Dale Peterson). New York: Houghton Mifflin Company. 2002 The Ten Trusts: What We Must Do To Care for the Animals We Love (with Marc Bekoff). San Francisco: Harper San Francisco. 2005 Harvest for Hope: A Guide to Mindful Eating (with Gary McAvoy and Gail Hudson). New York: Warner Books. 2009 Hope for Animals and Their World: How Endangered Species Are Being Rescued from the Brink (with Thane Maynard and Gail Hudson). New York: Grand Central Publishing. 2010 50 Years at Gombe. New York: Stewart, Tabori, and Chang. 2014 Seeds of Hope: Wisdom and Wonder from the World of Plants (with Gail Hudson). New York: Grand Central Publishing. 1988 My Life with the Chimpanzees. New York: Byron Preiss Visual Publications, Inc. Translated into French, Japanese and Chinese. Parenting's Reading-Magic Award for "Outstanding Book for Children," 1989. 1989 The Chimpanzee Family Book. Saxonville, MA: Picture Book Studio; Munich: Neugebauer Press; London: Picture Book Studio. Translated into more than 15 languages, including Japanese and Kiswahili. The UNICEF Award for the best children's book of 1989. Austrian state prize for best children's book of 1990. 1989 Jane Goodall's Animal World: Chimps. New York: Macmillan. 1989 Animal Family Series: Chimpanzee Family; Lion Family; Elephant Family; Zebra Family; Giraffe Family; Baboon Family; Hyena Family; Wildebeest Family. Toronto: Madison Marketing Ltd.
1994 With Love (illustrated by Alan Marks). New York / London: North-South Books. Translated into German, French, Italian, and Japanese. 2001 Chimpanzees I Love: Saving Their World and Ours. New York: Scholastic Press. 2004 Rickie and Henri: A True Story (with Alan Marks) New York: Penguin Young Readers Group. This page was last modified on 1 June 2016, at 16:25.